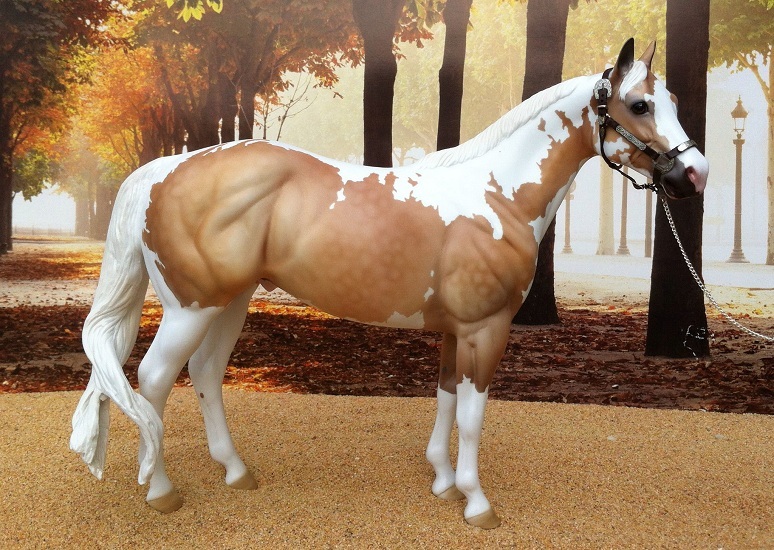 OOAK Peter Stone ISH Please note that much of my Paint stock is race-bred, and you will find heavy Thoroughbred and Quarter Horse influences through many of their lines. Diamond Hustler (Huslers Ole Man -r x Marantha Zippy -r, Zip To Impress) 1989 black frame Overo. OF Micro Mini. Crops 1993 - 2009. Breezin' Phoenix (Breezin Versary - FV Sandy Phoenix [qh], Phoenix Diamond) 1991 buckskin Sabino Overo. Crops 1995 and on. LS PLACED. Crops 1995 and on. Bachelor Splash (CBF Splashdown x CBF Bachelors Buttons, Zippo Big Star) 1991 sorrel frame Overo. CM Breyer QH. LS PLACED. Crops 1995 and on. Kurrency (Battle Kommand TB x Revenues Miss Doll, Porcupine Fewspots -r) 1991 chestnut Frame Overo. Crops 1995 and on. OF Running Foal. Los Pulgas (Sputniks Tacky Beau -r x SLM Onyx Bars, Mr. Robin Bars) 1994 Dunskin Frame Overo. OF Stone "Matinee Idol". PS PLACED. Crops 1998 and on. Dangerous Gambit (Bahas Gambler x Double Daquiri, October Flight Parade) 1995 palomino Overo. Crops 1999 and on. Breezin Eagle (Breezin Phoenix x Moon Dove, Moonhawk TB) 1995 bay Frame Overo. CM Running Foal. Crops 1999 and on. Simanith (Canth -r x Shocking Touch, Sock To Impress -r) 1996 sorrel Overo. Crops 2000 and on. Spanish Skipper (Breezin Phoenix x Spanish Sizzle, Spanish Array QH -r) 1996 sorrel Frame Overo. Crops 2000 and on. Dos Equis (Los Pulgas x Crown Royal Ebony TB, Crown Royal Legato) 2004 grulla Frame Overo. Crops 2008 and on. Always A Cajun (Always The Choice -r QH x Cajuns Miss Barlink -r, Cajun Indio) 2005 blue roan Frame Overo. Crops 2009 and on. Strategic Clu (Strategy -r x Mcdonalds Miss Clue -r QH, Kid Clu) 2007 sorrel Frame Overo. Crops 2011 and on. Coastal Shimmer (Pacific Jet x A Shimmer TB, Hail To Success -r) 1989 brown Tobiano. Excellent racing lines! OF Peter Stone Chip. Crops 1993 - 2009. Ebony Diamond (Black Mystery x Diamond Zip, Diamond Naiche) 1994 black Tobiano. Crops 1998 and on. Suicide Squeeze (Tarzans Ace High x Pretty Good Year TB, *Boule Vardier) 1996 sorrel Tobiano. LS Placed. CM PS WPH. Crops 2000 and on. Hollywood Martini (Coastal Shimmer x Fifth Martini, Far Bounding Too) 1996 bay Tobiano. OF PS Pebble. Crops 2000 and on. Vegas At Night (All Night High -r QH x Special Vegas Moon, Special Ruler -r QH) 1999 buckskin Tobiano. LS/PS Champion, Stakes Winner. Okie Rio Resin. Crops 2003 and on. Martini Night (Vegas At Night x Fifth Martini, Far Bounding Too) 2002 buckskin Tobiano. Crops 2006 and on. Far Too Dandy (Dandy Bar Leo x Far Too Lovely, Far Too Tough) 2007 black Tobiano. Crops 2011 and on. Far Too Dark (Far Too Dandy x Sky Attach, Clint Black) 2011 black Tobiano (hzy). Crops 2015 and on. Baliamos (Movin To The Music -r x Spanish Sonnet -r, Pawnee Bummer QH) 1992 chestnut Tovero. CM New SM Stock horse. LS PLACED. Crops 1996 to 2012. Devil Moon (Mississippi Moon x All These Years) 1995 chestnut Medicine hat Tovero Paint stallion. Placed 2nd in first LS. Crops 1999 and on. Tony Stark (Presumed Guilty -r x Misty Joes Gold -r, Joes Coppy) 2002 palomino tobiano/sabino. OOAK ISH. LS PLACED. Crops 2004 and on. Spanish Sizzle (Spanish Array QH -r x Sizzlin Luck QH -r, Sonny Go Lucky) 1985 sorrel cropout Overo. Revenues Miss Doll (Porcupine Fewspots -r x Revenues Blue Doll QH -r, Revenues Blue Pal) 1986 flaxen chestnut Overo. OF Running mare. Shocking Touch (Sock To Impress -r x Skeeters One Truth -r, Skeeter McCue) 1988 sorrel Overo. OF Micro Mini. Overdun (Sockett -r x Heavy Impression QH -r, Mr Impression) 1989 dun Overo. Psychic Kestrel (Kestrel Warrior x Pyschic Blue QH, Oso Blue -r) 1988 grey Overo. Moon Dove (Moonhawk TB x Bar Mounts Dove, Bar Mounts Image) 1989 bay Overo. Honey Sweet (Gold Chunk -r x Negotiate Sweetie QH -r, Negotiator) 1989 palomino minimal Overo. Ce Me Sizzle (C-Leo-Run x Spanish Sizzle, Spanish Array QH -r) 1990 sorrel Overo. Dam of winner SIZZLIN LEO. Rio Dancer (Bahas Gambler x Sierra Style, Mylon's Moring Star) 1995 palomino Overo. PRR#0511. MJS Guns And Roses (MR Whispering Storm Chief x MR Renaissance Rose, Extra Nice) 1997 chestnut Overo. Martini Toast (Simanith x Fifth Martini, Far Bounding Too) 2000 chestnut Overo Paint. Impressive Moment (Hez So Heavenly -r x LP Deluxe Moment -r, Impressionist) 2007 chestnut Splash Overo Paint. Lady Bay Leo (Leo San Man -r x Bay Bee Jones QH -r, Red Joe Jones) 1970 dun Tobiano Paint. Fifth Martini (Far Bounding Too x Fourth Martini, Scotch Bar Time -r) 1992 sorrel Tobiano. Nocturne Flight (October Flight Parade x October Nocturne) 1995 chestnut Tobiano. Cashier's Check (Tabasco -r x Blue Skies Again TB, Great Above) 1996 bay Tobiano Paint. Olympic Charmer (Treasure Scout x Olympic Winner, Olympia Joe -r) 1999 bay Tobiano Paint. OF G3 SM. Shoo Bee (By Yawl One -r x Shoo Foot QH, Calyx -r) 1999 bay Tobiano Paint. Autumn Rose (Golden Dawning x Nocturne Flight, Bahas Gambler) 2003 palomino Tobiano Paint. I Bee Ziggin (Ziggin Jet Too x Shoo Bee, By Yawl One -r) 2003 buckskin Tobiano Paint. Calafia (Easy Jet Too -r x Hustler's Suprise, McCue's Hustler) 1999 bay Tovero Paint.